Meathead Movers is here to take care of the heavy lifting for you on your move to Arroyo Grande. Our clean-cut student athlete movers are ready to get you safely settled into your new Arroyo Grande home. While much of California’s coast is densely populated, there are still a few quaint cities that have managed to retain less of an urban feel. 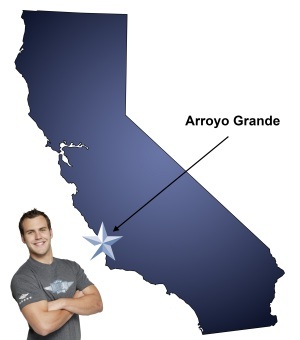 One such option is Arroyo Grande, a smaller municipality located along the central California coast. With a population under 20,000, Arroyo Grande has the feel of a small town while still having the coastal location that draws so many people to the area. For those who would like to make this city home, be sure to invest in the right Arroyo Grande movers to streamline the process. Arroyo Grande was originally home to the Chumash tribe. The town was officially formed in 1862 and incorporated in 1911. Today locals enjoy the charming historic village and the plentiful shops for antiques, hand crafted jewelry and more. The swinging bridge is Arroyo Grande’s most famous site, although many people also enjoy the Heritage House and Museum. The city is regarded for its Strawberry Festival and the Arroyo Grande Valley Car Show. Settling in Arroyo Grande is clearly no hardship. However, making the move can be difficult if the right Arroyo Grande movers are not employed. Thankfully, Meathead Movers is a wonderful option, providing moving services all throughout California. Whether the move is local, long distance, or commercial, Meathead Movers has what is necessary to complete the move without stress. For added convenience, Meathead Movers also offers packing and storage services, and we can be contracted to complete commercial moves and on-site relocations. This wide range of services is compelling, but there are more reasons to trust Meathead Movers. Many moving companies have low standards but Meathead Movers recruits only the most respectable student athletes. Employees are held to rigorous standards, completing training at Meathead University and abstain from smoking and drugs, both on and off the job. Employees are also trained to practice our signature Meathead HUSTLE, which has our movers jogging when not carrying anything. This distinction not only shows our dedication but ensures that your move is completed quickly and efficiently for maximum convenience. While there are many Arroyo Grande movers, none can compare to Meathead Movers. With high quality services and thoroughly trained employees, Meathead Movers stands out in all the best ways. Please contact us today for a free quote and see how Meathead Movers can simplify your move. Moving to Arroyo Grande? Here are some helpful resources. “Dependable, energetic, clean, honest, reliable, personable, etc.etc. View more Arroyo Grande resources. Dependable, energetic, clean, honest, reliable, personable, etc.etc. Have always been impressed with your business ! Efficient and professional! ?? them!